For those who are on a gluten free diet, finding a frozen gluten free pizza that taste good seems unlikely. However, my six year-old son recently exclaimed. “Dad, I love this pizza”. The pizza he was referring to was Glutino’s Duo Cheese pizza. And it does taste great. Plus it has the thick doughy crust of what I remember of a hand tossed pizza. Only one problem. They taste so good that my kids devoured all that I had bought before it was my turn to "cook" on Friday night. Despite an emergency run to the local Whole Foods, Safeway and King Soopers I could not find any more or any of the Amy's gluten free cheese pizzas. That left us with gluten free nuggets. But I still have to tell you about those. 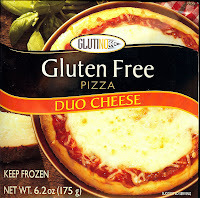 The gluten free Duo Cheese pizza is made with tapioca starch and corn starch. This gluten free cheese pizza is small and tastes great to kids. The pizza has 10 grams of protein, 12 grams of fat, 5 grams of which are saturated. It is listed as a single serving of 420 calories, 110 coming from fat, but small children can split this pizza. It is not a low fat dish but a nice treat for kids on a Friday night who miss traditional pizza because they are following a gluten free diet. Glutino foods are based in Quebec, Canada. They offer a wide variety of gluten free foods. I will be reviewing gluten free chicken nuggets and chicken strips as promised. but the strong endorsement of the Glutino pizza from my son moved it up in The Gluten Free Food Report priority. Finding something easy, tasty and fun for a night at the movies at home can be a challenge in a gluten free household. As a doctor who is considered an expert in celiac disease and personally gluten sensitive married to another doctor with Celiac disease, I have learned first hand about these challenges of the gluten free diet. I hope sharing my experiences will help those Moms and Dads out there trying to maintain a gluten free diet for their kids with celiac disease, non-celiac gluten sensitivity or at risk for celiac.